Ideal for Home/SOHO users, PowerGuide management software provides a user-friendly interface for your power systems. The graphic user-interface is intuitive and displays essential power information at a glance. Download today to explore more functions of PowerGuide management software. A personal computer installed with PowerGuide can be connected to the UPS through USB/ serial port to monitor the UPS and perform system graceful shutdown. 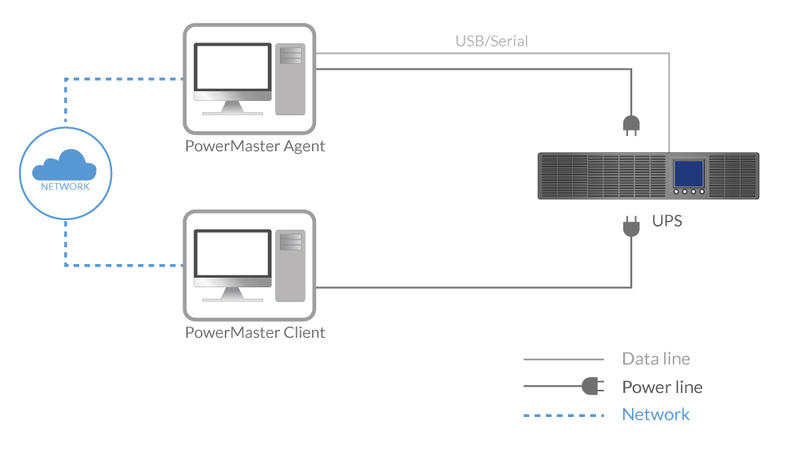 PowerMaster management software is ideal for users to monitor and manage the power status. It provides elegant, unattended shutdown of network computers and virtual machines connected to a battery backup during a power event. Power alert notifications can be sent via email, text, or instant message. This software allows users remote access (from any network PC with a web browser) to critical power information, including battery condition, load levels, and runtime information. It also includes OS shutdown, event logging, internal reports and analysis, remote management, and more. By installing PMCARD to the UPS, each computer powered by the UPS should be installed with “Client”. Through the network connection, the users can monitor the UPS and perform system graceful shutdown. UPS management via USB or serial port requires a standby computer installed with “Agent”. Other computers that are also powered by the UPS should be installed with “Client”. Through the network connection, the users can monitor the UPS and perform system graceful shutdown. The Power Device Network Utility scans the network devices for media access and displays complete equipment list found. It comes with installation wizard for clear step-by-step setup. The intuitive interface makes it an easy-to-use utility for finding remote management cards, configuring the located devices with a specific IP address, subnet mask, and gateway address, allowing them to work properly on the network.